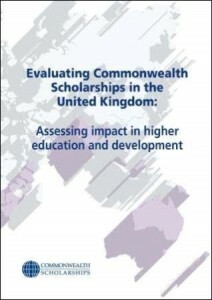 This report examines the impact that Commonwealth Scholarships and Fellowships can have on individuals and on higher education institutions, and the impact that these individuals and institutions can then have on economic and social development. It reports on the targeted awards offered to academic staff and students, before moving on to assess the impact of alumni working in higher education who responded to a 2008 impact evaluation survey. Finally, the report narrows its focus to take a closer look at Commonwealth Scholarships and Fellowships in the context of three specific HEIs: Makerere University in Uganda, the University of Dhaka in Bangladesh, and the University of the West Indies in the Caribbean.